Design a product ecosystem that extends beyond the screen. The solution must include multiple touchpoints across multiple channels, and these components must work together in supporting a user or community of users as they attempt to achieve some practical goal. The final project for the Introductory Interaction Design Studio course at Carnegie Mellon University was rather open-ended—our only constraints were that we had to design a product ecosystem, and that at least one of the components could not be screen-based. I wanted to create an unconventional product ecosystem that focused more on enriching experiences and less on providing services. I decided to focus on the act of listening to music—an often unisensory and often passive activity—in order to explore the possibility of designing a richer, more engaging, and more robust experience through the means of a multi-sensory product ecosystem. In addition, the internet has offered more platforms and avenues to discover music, but for the same reason, there is less opportunity to connect and engage with an act. Thus, I felt there was opportunity for design to help connect artists and fans on a deeper level. Tinariwen is a musical group comprised of members of the Toureg tribe, a nomadic tribe from the Sahara desert in Africa. Tinariwen's mission has always been to share their unique nomadic culture and story with the world. Not everyone has the opportunity to visit the desert or attend concerts, but a familiarity with the band members and their culture and history greatly enhances the appreciation of the artists and their music. Because they are not widely known, because they are from a remote part of the world, and because their music is so unique, I felt that they were the perfect music group for which to design a product ecosystem that enhances the experience while also connecting them to their fans around the world. From novices, I hoped to learn how novices respond to the music having never heard it before, and whether listening to the music sparked any further interest in learning more about the band or the culture. From fans, I hoped to learn how they got introduced to the music, what got them hooked, their level of interaction with the band, platforms they use, and what value they get from listening to the music. As I am not Touareg myself nor do I understand their language, it was important for me to hear from the tribespeople that Tinariwen represents to ensure I the final product accurately reflected their culture, goals, and needs. Thus, from the Touareg, I hoped to gain perspective on what they perceive to be the most important aspects of the culture, what they would like people to know about them, and what Tinariwen's music means to them. 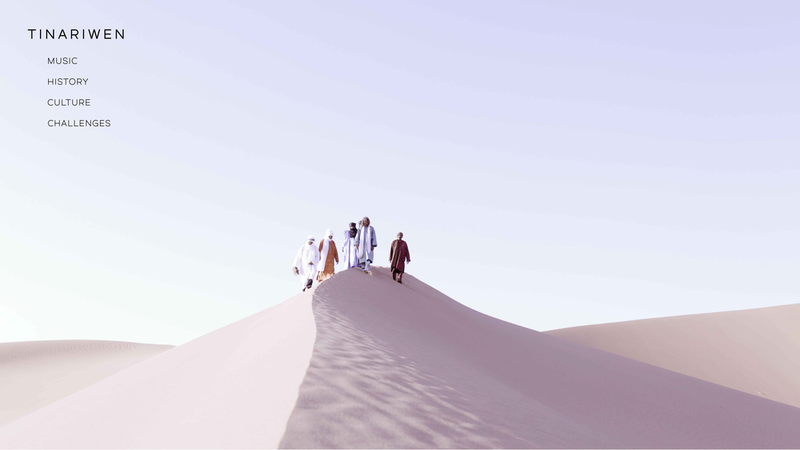 From Tinariwen, I intended to learn about the message they want to convey through their music and which elements of their culture they most value. saw, and if there is anything more they would like to learn about the band based on the experience. FANS: Give them questionnaires to learn how they got introduced to the music, what got them hooked, their level of interaction with the band, platforms they use, and what value they get from listening to the music. TOUAREG: Interview or send questionnaires to Touareg friends to get their thoughts on the most important aspects of the culture and what they would like people to know about them. Research Touareg culture more to identify artifacts that could be easily shared. TINARIWEN: Read and listen to interviews to identify what aspects of their culture they are most eager to share. Read liner notes to albums. Ask/interview them in person, if possible, about the message they want to convey, and try to share that with listeners. MORE INFORMATION on the research process, methods, and outcomes is available in the process documentation. Through my research, I was able to identify what Tinariwen and their people wish to share with the world, and what their listeners wish to learn from them. The ultimate design goal, then, is to match these needs, and in so doing, establish a stronger connection between the artists and their audiences. For my final concept, I decided to focus on a cultural immersion through Tinariwen's music. Based on my research, sharing the culture satisfied the need of both the band and the listeners, while the music provided a compelling entry-point for exposure to the culture. One without the other would not have been as engaging nor would it have satisfied the either group’s needs to such an extent. The design solution would employ the popularity of Tinariwen’s music as an entry point, but the ultimate purpose would be to share the culture, traditions, and struggles with fans. MORE INFORMATION on concept exploration and development is available in the process documentation. Because so many of the fans that I had interviewed engaged with Tinariwen through some online platform, I knew that an online component was essential to the final design, and that it should educate, inform, intrigue, communicate, and connect visitors with Tinariwen and the Touareg people. It engages the eyes and the ears. Fans and novices alike were both curious and interested in learning about their culture, so I designed a visually immersive web portal that focuses on Touareg culture as the band themselves experience it. This could easily supplement their existing website, giving curious fans easy and quick access to information about the music, the culture, the band, and the challenges the band is facing today. In designing the interface, I researched various immersive websites related to music, travel, and culture that received or were nominated for Webby awards. I found the most effective ones to have full-screen images, with very minimal icons and navigation bars. Based on my research, I knew that the visuals were an effective means of communicating the culture while also piquing curiosity, so I selected images that were particularly striking and impactful. The "Listening Party in a Box" is meant to recreate the experience of being with the band themselves. One of the lead singers of Tinariwen’s always begins his concerts in America with “You are welcome to the desert.” It is apt, as the music has a way of transporting the listener to a faraway place. I felt the phrase was fitting for the box as well, as the artifacts are meant to immerse the user in a different environment, and provide some insight into what daily life might be like for the Touareg in the desert. The Box allows for a deeper connection of the artists and fans. Fans are not passively listening to the music without understanding the deeper meaning to it, but are having a fully immersive and engaging experience with the music by fully engaging all five senses. Touch is engaged through the Touareg's signature indigo fabric. Hearing is captivated by the music. Classic gunpowder green tea drunk copiously by the Touareg stimulates taste, while incense sticks immerse one in scent. Finally, a book of Tinariwen's stunning poetry rivets the eyes and mind. The box fits into nearly every phase of Shelley Evenson’s Experience cycle. The unique artifacts with the music help Connect and Attract party guests. The User Guide helps Orient; the physical components allow for Interaction, and also Extend and Retain as they serve as reminders and souvenirs, and the sharing component allows for Advocacy. The fold-out User Guide enables users to scan detailed information about all the elements in the box at once. The outside pages have a welcome message, ideas for using the box, and the box contents. The inside contents include a brief explanation of the artifacts as well as “Ways to Share” them each. The Touareg indigo fabric has a unique shimmer to it, so it was difficult to substitute another fabric in place. Thankfully, a friend of mine had a piece of fabric and was willing to mail it to me. It was smaller than I would have liked, but still felt it was important to include the authentic fabric and not a substitute. I was able to find a journal article specifically about the importance of perfume and aromas in Touareg culture, and it mentioned that incense is used in various rituals and ceremonies. It specifically mentioned sandalwood and amber incense—both of which are readily available—so I bought incense sticks and included them in the box with a label. Green tea is such a critical part of the Touareg culture, that it was the one element I knew I had to include. I bought two small tea glasses for the box and loose gunpowder green tea. I found a tea recipe online and modified it to suit a beginner’s needs. I wanted the print interactions to each be different, so I printed the recipe in an accordian-style format. The Touareg come from an oral culture where poetry and eloquence is highly valued. Thus, their lyrics are not mere words, but actual poetry that speak of universal themes such as freedom, loss, love, home, nostalgia. They also speak to the struggles of the Touareg, which is why their music is often referred to as rebel music, or songs of the rebellion. Understanding the lyrics is critical to understanding the message that Tinariwen wants to convey, so communicating the lyrics was an important element of the design solution. I printed and bound the book myself, creating a prototype first to ensure the binding would hold. To cover the binding, I printed a cover on textured pearlescent paper, scored the spine, and glued the pages to the book cover. I covered the spine once more with gold washi tape to add an element of sparkle. I kept the book cover stark and simple, hearkening to e.e. cummings and keeping the title all lowercase. 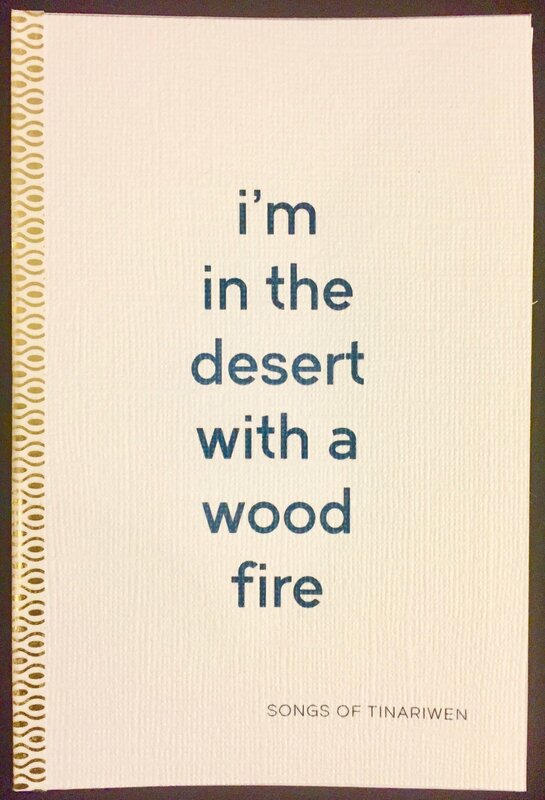 I own books of poetry in which the book title is also the name of a poem within the collection, and I felt the song title “I’m in the Desert with a Wood Fire” was an appropriate title for the mood and atmosphere of both their poetry and their music. It also matches the “Welcome to the Desert” theme of the box set well. 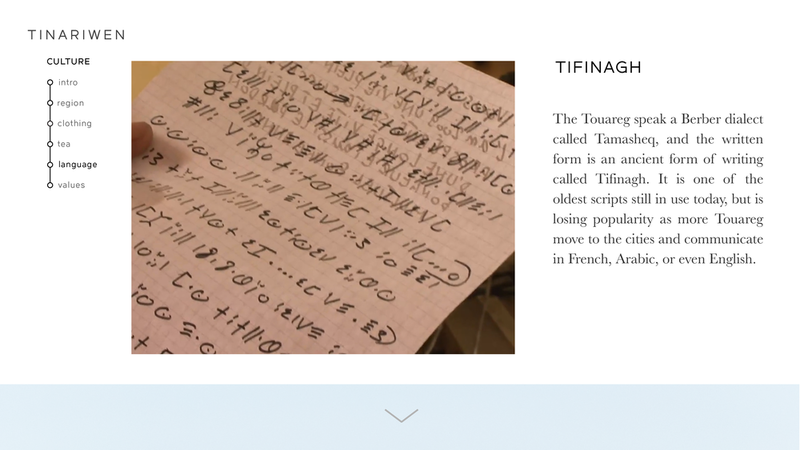 The written form of the Touareg language is called Tifinagh, and it is one of the oldest scripts in the world, consisting of geometric shapes. 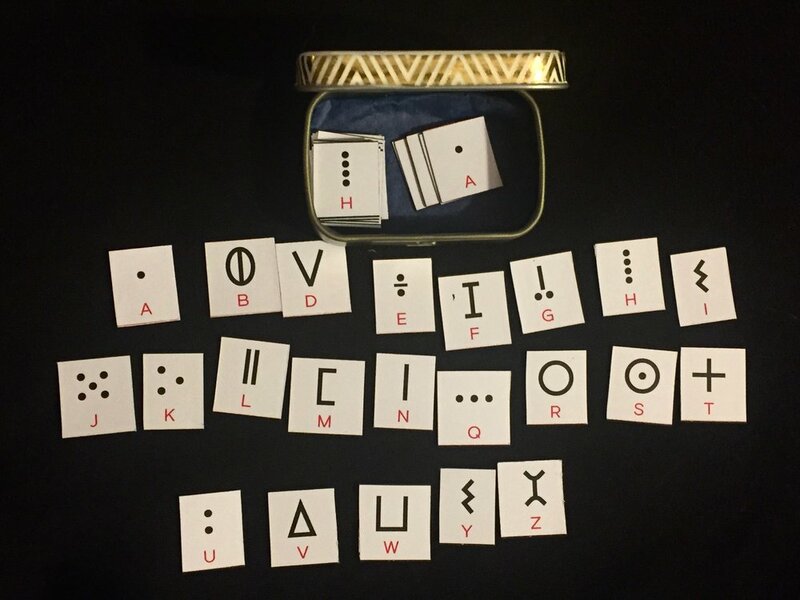 It is still in use today, so I decided to create Tifinagh “alphabet magnets.” This required some research, as there are variations of the script depending on which region of North Africa you are from. I wanted to stay true to the script that Tinariwen use, which took some time to match up. Once I determined the alphabet they used, I had to do some additional digging to identify which letters correspond to the sounds common in the English alphabet. Because I can read Arabic, I found a Tifinagh-Arabic phonetic matching and discarded the letters that do not correspond to English sounds. I then recreated the alphabet in Illustrator, and matched it the alphabets to the English letters. I printed strips of paper, adhered them to magnetic tape, and then cut out the individual letters. I made four sets total. 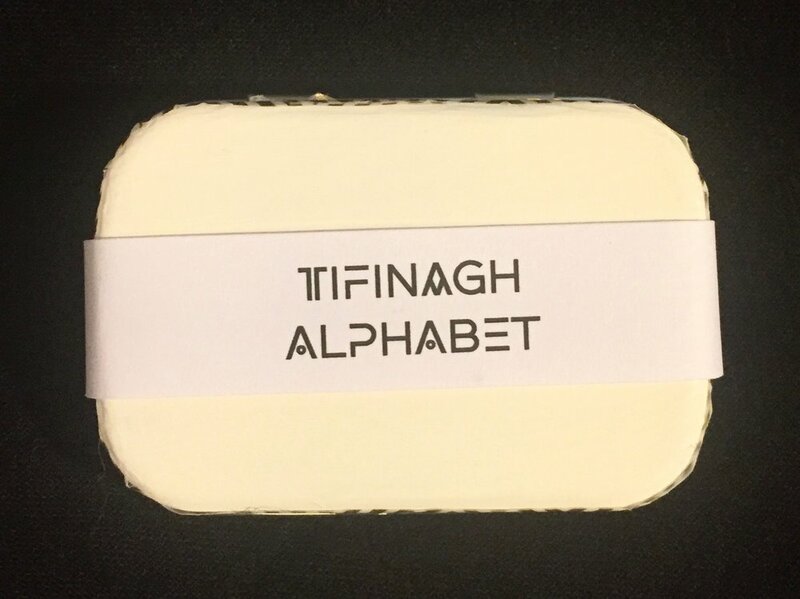 The magnet holder is made from an Altoids tin, painted white with a touch of gold washi tape. The outer box was painted in a deep charcoal chalkboard paint to mimic the deep dark of a desert sky. The title was painted on using a stencil. The inside of the box was also painted, with a dark, deep blue. I printed out a photograph of a “khomeissa” (a typical symbol in Touareg culture), and applied it to the inside cover of the box. I again added some gold washi tape to keep with the theme. Inside box cover with "khomeissa"